For the past few weeks, I’ve been slogging through my Lightroom catalog in an attempt to cull, organize, & tag all my images. It’s a big job (<understatement of the year), & it doesn’t help that I keep getting derailed when I stumble across images that I had completely forgotten about & now kind of love. 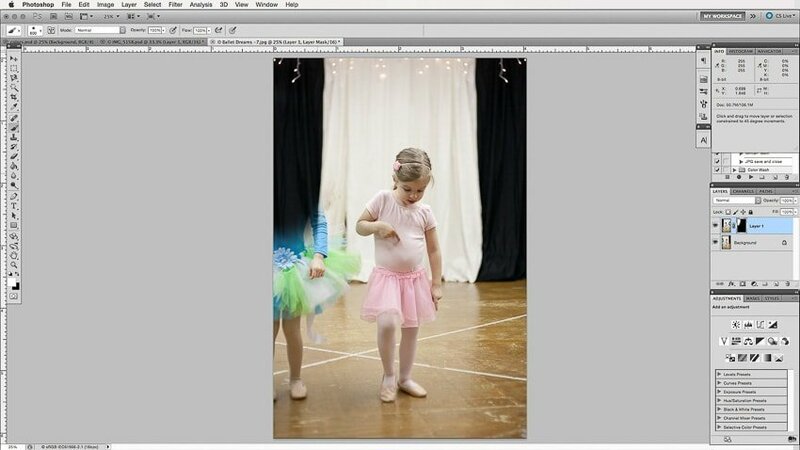 Like these of my little ballerina at her Christmas studio recital way back in 2011. I loved the way that she was intently watching the “big girls” as they practiced their recital piece. You could almost see her longing to be one of them as she stood on a chair to boost her up high enough to see through the studio window. The image on the right especially caught my eye. 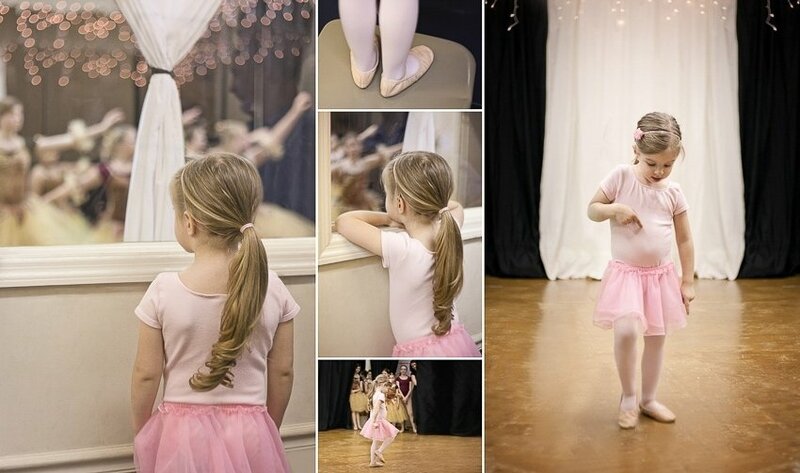 I loved her little pointed fingers, blurred foot, & the look of concentration on her face. Unfortunately, because this was shot during her performance, she wasn’t up there alone, & if I tried to crop the other little girl out, I ended up with a composition I didn’t like at all. So I decided to try a trick I’ve used a few times here lately. It only works with certain types of backgrounds, such as very out of focus foliage, or in this case, curtains. 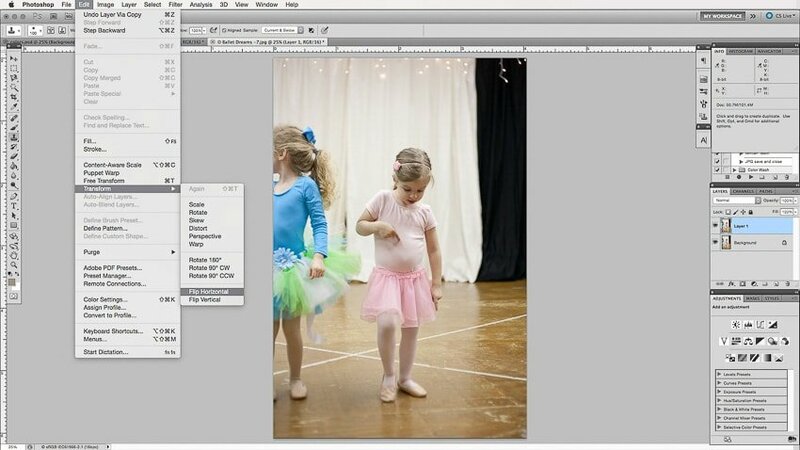 I pulled the image into Photoshop & duplicated the background layer (Cmd+J on a Mac). Then I went to the menu & clicked on Edit>Transform>Flip Horizontal. Now I had a mirror image of the original sitting on top. I added a layer mask & inverted it (Cmd+I) to hide the new layer. Choosing a soft white brush, I painted on the mask to conceal the other girl and reveal the black curtain. The image was almost where I wanted it to be now. 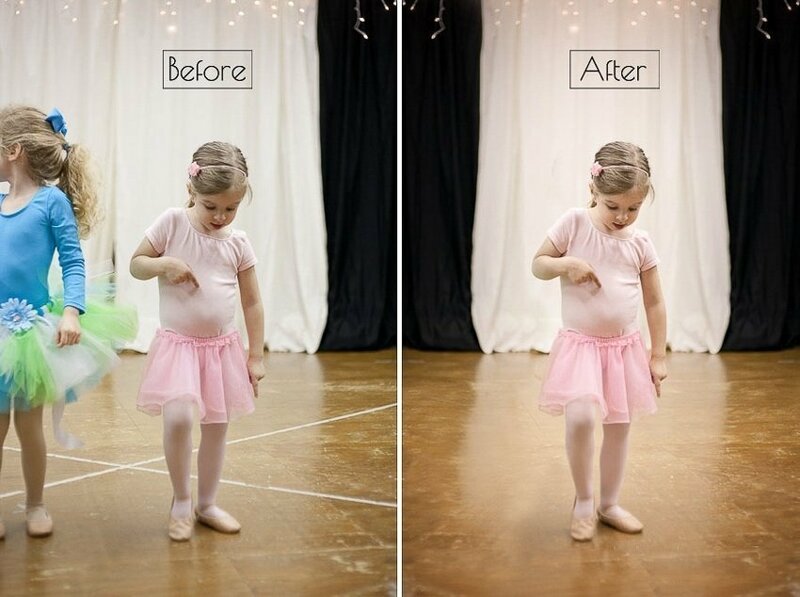 There was just a tiny sliver of tutu still showing, & those taped lines on the floor. 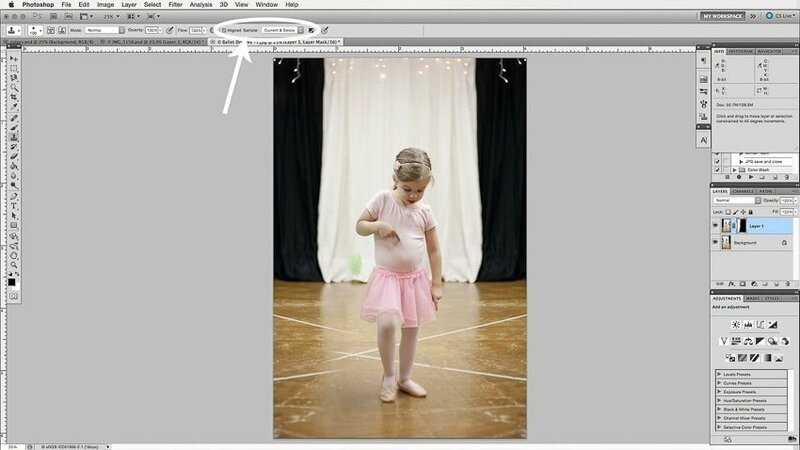 So there you have it – a quick, simple way to turn a snapshot into a printable memory.